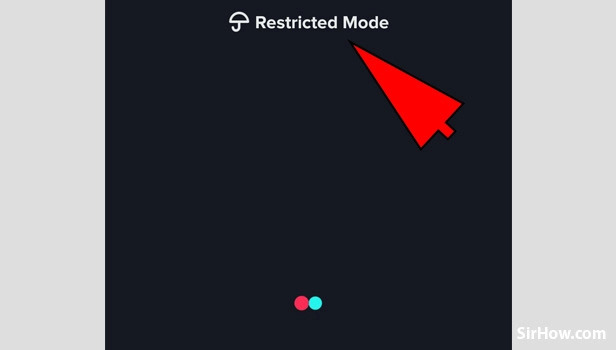 TikTok allows its users the option of enabling a feature called restricted mode. The restricted mode feature is one that filters out or restricts the content that is available to the user by setting a password. This feature is used to filter out either inappropriate or age restricted or mature content. TikTok provides this option to any of its users. You have to follow the steps explained below in order to enable restricted mode on TikTok. 1. Launch TikTok application : In order to enable restricted mode, you have to first launch the application. 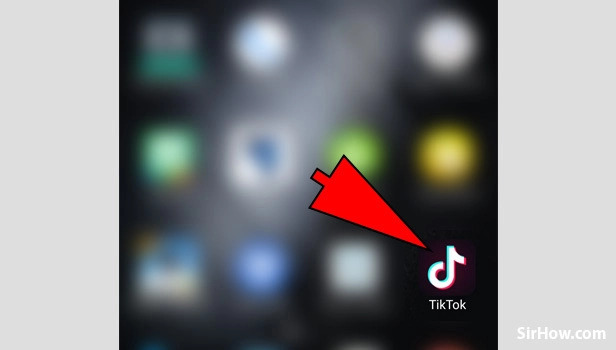 To open TikTok, locate the trademark music note icon as shown below, in your app drawer. Once you find the icon, Tap on it once to open. 2. 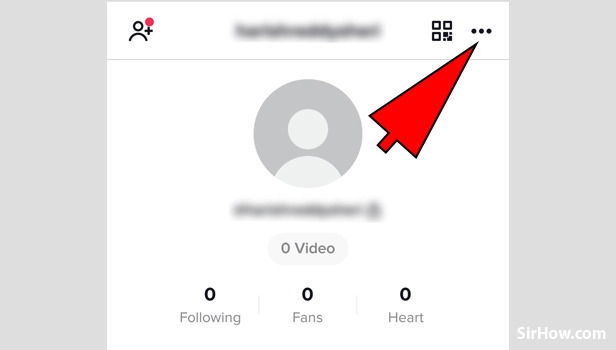 Go to "Profile" section: Opening the TikTok application will give you the feed section as shown below by default. 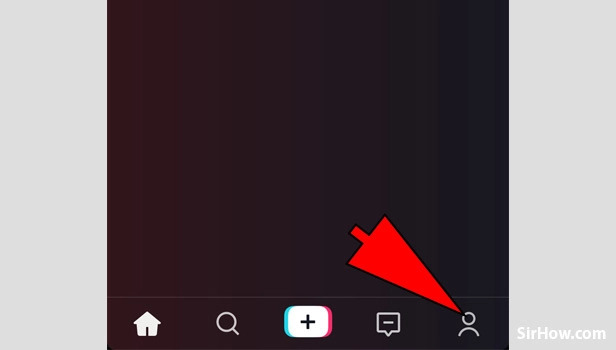 From the feed section, you have to go to the profile section by tapping on the person icon that is indicated by the arrow below. 3. Tap on the Three dots option: The profile section of your TikTok account will open as shown in the picture below. As indicated by the arrow mark, you will notice three dots in the top right corner of the screen. This three dot icon represents the options wherein you can find multiple profile options. Tap on it once to access. 4. Select "Privacy and Settings": Tapping on the Three dots option will give you a drop down menu. From the drop down menu, Tap on "Privacy and Settings" once that will open up the privacy settings for your account. Tapping on the Privacy and settings options will give you the screen as shown below. 5. 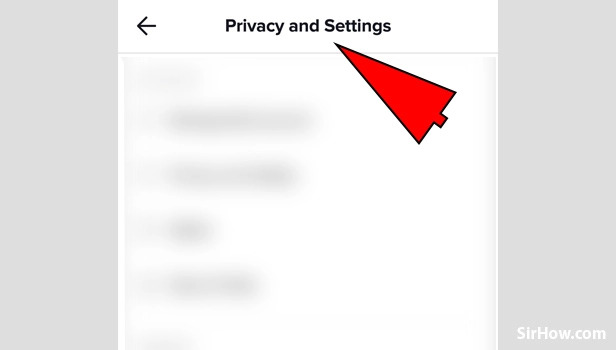 Tap on "Digital well being": In the privacy and settings section, you will find many privacy based options as shown below. 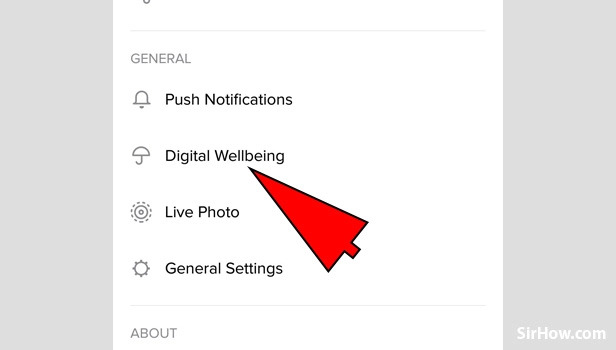 You have to locate the option of "Digital wellbeing" and tap on it once. This option will be present in the "General' sub-section of the Privacy and settings section. 6. 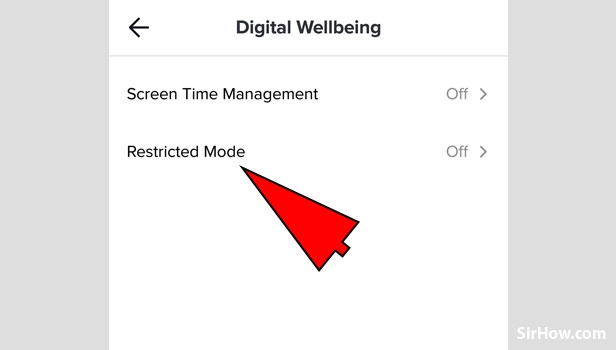 Select Restricted Mode: Tapping on the Digital wellbeing option will give you the screen as shown by the picture. You will notice two options on this screen from which you have to select one. Tap on the "Restricted Mode" as indicated by the arrow. 7. Enable "Restricted Mode": When you tap on the option for Restricted Mode, it will give you the screen as shown below. This screen will display a message as well as provide an option to enable restricted mode. Tap on the "Enable Restricted Mode" option as indicated by the arrow mark below. 8. Set Password: Enabling the Restricted mode will give you the following screen. This is the screen wherein you have to set the Password of your choice. Tap on the black rectangular space as indicated by the arrow mark. Your keypad will launch automatically by which you can enter the password of your choice. 9. Tap on "Next" option: Entering your password will provide you with an option to go Next. As shown by the picture, Next option will be located at the bottom of the screen as shown below, through which you can carry out the remaining steps. Tap on the next option to go ahead with enabling restricted mode on TikTok. 10. 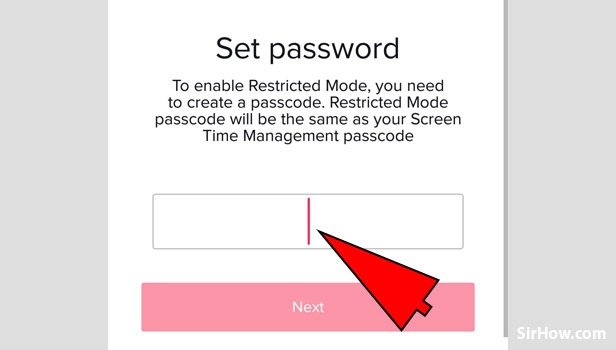 Re-enter the password to Confirm: Tapping on the Next option will give you the following screen. This is the screen in which you have to confirm the password that you entered in order to confirm the password. 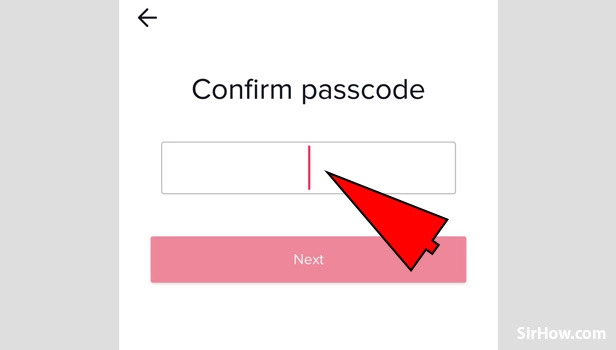 Tap on the rectangular space as indicated by the picture below and enter the same password as earlier. 11. 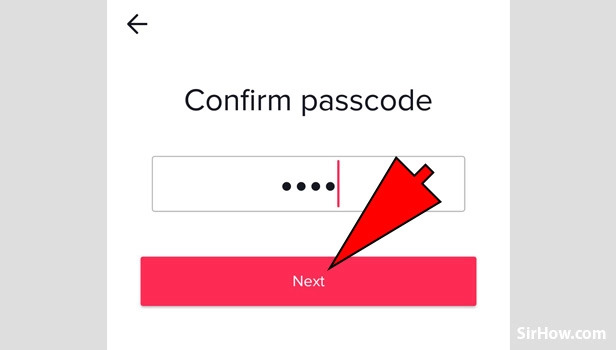 Tap Next to Confirm: Entering the confirmed password will provide you with another next option. The Next option is located at the bottom of the screen and allows you to confirm the enabling of restricted mode. Tap on the "Next" option as shown below and you have enabled the restricted mode on TikTok. 12. 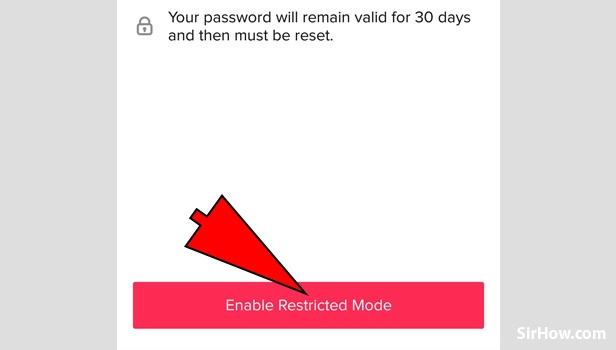 Identify the "Restricted Mode": At the end of carrying out all the above-mentioned steps, Restricted mode will be enabled on your TikTok account. To confirm that it is enabled, Go to your feed section. You should notice a message at the top of the screen as shown below. By this, you should know that you have enabled restricted mode on TikTok. 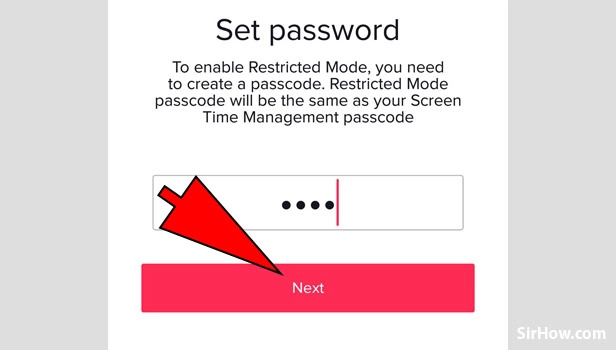 Thus the above article explains the steps to be followed to enable restricted mode on TikTok. The procedure to enable Restricted mode is simple as well as easy to carry out. You can find the option available in the privacy and settings section in the profile section of TikTok.